It seemed like a mistake when the cab stopped in front of the building that holds the Ralph Pucci showroom: Montclair nonprofit organization Jazz House Kids were performing on Jan. 31, and Christian McBride, the jazz bass player and Grammy Award-winner who doubles as Jazz House’s artistic director, was going to be in conversation with avant-garde performance art musician Laurie Anderson in “Conversations with Christian.” Surely the venue should be a club? It was no mistake. 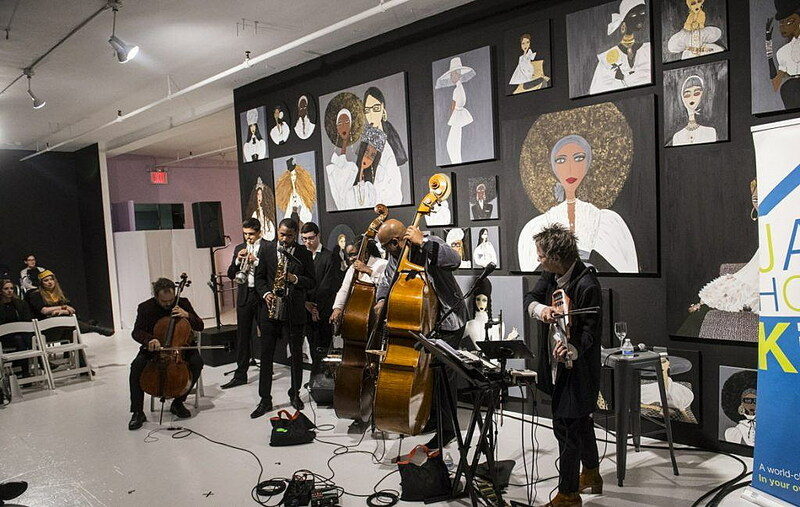 This is the third RALPHPUCCI Salon featuring Jazz House Kids at the designer’s 30,000-square-foot space on West 18th Street in Manhattan, filled with beautiful furniture and art. McBride said that when Jazz House Kids president and founder Melissa Walker, who is also McBride’s wife, befriended Pucci, they’d asked about a possible donation. Instead, Pucci offered Jazz House Kids the space once a year. Pucci was a musician himself and a fan of jazz, said Walker, and played the drums. “When you call Ralph Pucci, you will hear jazz playing, always,” she said. Pucci had seen Jazz House Kids at a donor party, with Pat Metheny as a guest. “He got to experience the mission,” she said. 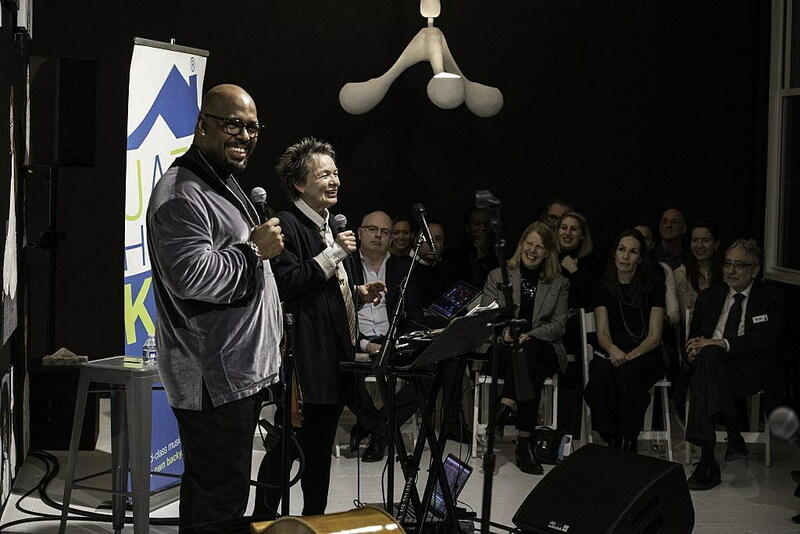 That mission includes bringing jazz into the schools and building a “jazz house,” a place for young musicians to learn and grow, work with established artists. Every summer Jazz House Kids, now 17 years old, holds a summer workshop, and presents the Montclair Jazz Festival. This year, the RALPHPUCCI Salon raised money for CHICA Power, an education and performance program for young women. The first year of the salon, Jazz House Kids brought jazz guitarist and singer John Pizzarelli. Last year, they brought bass player Esperanza Spalding. And this year, they invited Laurie Anderson. McBride said they’d get Anderson out to Montclair at some point. McBride and Anderson were joined onstage by Albanian cellist Rubin Kodhelli at “Conversations With Christian” last Thursday, Jan. 31, in front of about 150 patrons, donors, guests and parents. The conversation was taped for McBride’s radio show “The Lowdown: Conversations with Christian,” which airs on SiriusXM. “We really wanted to bring all kinds of artists, those artists who are in the lines, and those artists who are outside the lines,” Walker said. During the conversation, McBride talked to Anderson about a concert she’d done in Australia for dogs (with their owners): “Dogs are such wonderful music fans,” Anderson said. He also interviewed her about her childhood, her work as a resident artist at NASA, and her evolution as a musician. One of eight children, she was never asked what she wanted to be, she said. Now she calls herself a “meaningless term, a multimedia artist,” she said, which allows her to paint, play music, and do other things — her undergraduate degree from Columbia is in sculpture — while at the moment, she’s particularly interested in virtual reality. Anderson talked about moving to New York from Chicago, and being inspired by her late husband, Lou Reed. When she was asked to be the first artist-in-residence at NASA, she said, “You’re not from NASA,” and hung up. But they called her back. They seemed surprised when she said her art project was going to be a long poem. “I was the first artist-in-residence at NASA. I was also the last,” she said, to a big laugh from the audience. 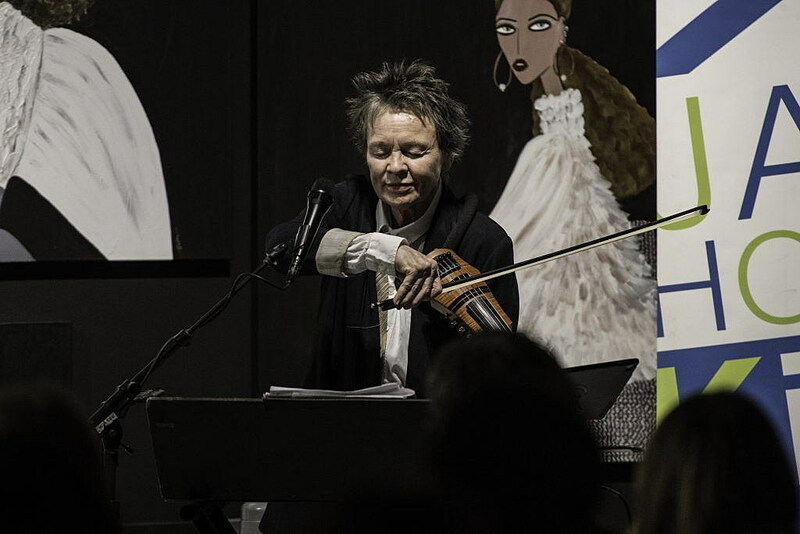 At times, McBride, Anderson and Kodhelli played together, Anderson playing on an electric violin that she created. One of the things she liked the best was a sequence McBride did with Anderson, Kodhelli, and a few senior Jazz House Kids players who joined them onstage, where the musicians created an impromptu tune around an image. Eighteen-year-old Jalin Shiver, a senior in Arts High School in Newark, played the fundraiser for the first time. The improv around imagery didn’t faze him: he’s done it before. “It’s more about listening and reacting, and that’s what I liked about it.” He has been playing with Jazz House Kids since sixth grade, crediting the group with leading him to pursue musical studies in college and in his career. Walker gave Shiver a hug after she heard that he has a scholarship to the Berklee College of Music.